The Florida Fish and Wildlife Conservation Commission (FWC) awarded $250,000 to five organizations in early 2018 to research and develop innovative methods to remove lionfish from deep-water habitat. Also, the National Marine Fisheries Service has finally approved a permit to set out 100 cages to study whether traps can be effective. The first lionfish was reported in South Florida waters in 1985. They were documented as established in the early 2000s. They have been reported along the southeastern U.S. coast from Florida to North Carolina. These invaders can be found in reefs, mangroves and seagrass meadows. They are voracious eaters that consume more than 50 different species, including shrimp, grouper, and lobster. Their ravenous appetite has eaten or starved out local fish and disrupted fishing. Some scientists believe lionfish are so widespread that we may not be able to reverse their effect on the ecosystems of the Western Atlantic. Adults grow up to a foot long and juveniles may be as small as one inch or less. According to the Florida Department of Environmental Protection, the lionfish has no known predators in the Atlantic, which has contributed to their numbers as well as their ability to spawn year round and spread. Florida has taken several steps to address the problem of lionfish. Among the measures are a prohibition on the import of lionfish for the aquarium trade, a ban on lionfish in aquaculture, yearly lionfish fishing derbies, a phone app designed to help the state collect data and raise awareness of the dangers of this invasive species and encouraging the development of a market for the tasty meat found under the fish’s spine. The FWC awards went to the University of Florida to field test and evaluate development and retrieval strategies for harvesting lionfish in deep water habitat with the use of non- containment curtain trap. The Reef Environmental Education Foundation will assess modified lobster trap and curtain trap designs and assess whether sound can be used as an attractant or an aggregation tool. American Marine Research Company will work to develop an agile and versatile underwater drone that can be used to control lionfish populations. R3 Digital Sciences will develop and promote fish trap extension kits for existing commercial spiny lobster traps that will convert them from indiscriminate traps into smart traps capable of targeting lionfish from depths greater than 130 feet. The Atlantic Lionshare Ltd. Will complete the development of a remotely-operated vehicle called the Reef Sweeper that can be used to harvest lionfish from beyond recreational diving depths. 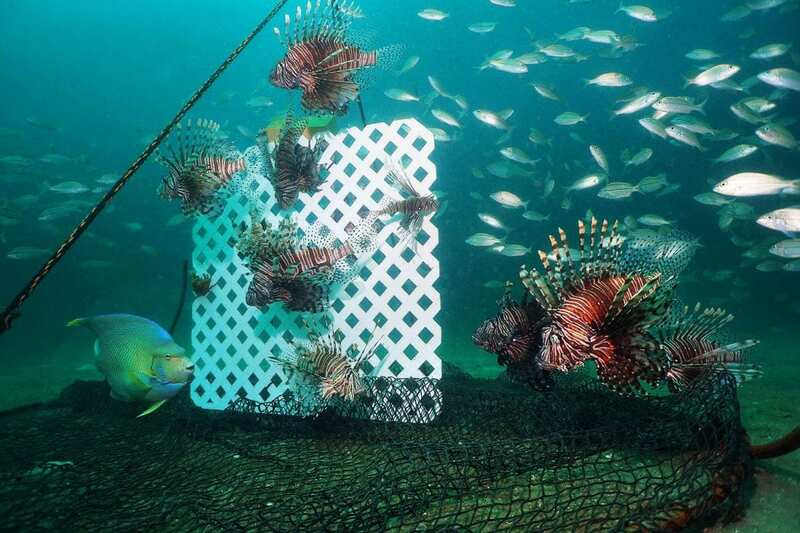 The FWC hopes by examining the effectiveness and performance of modified trap designs, they will be able to identify the best modification to maximize lionfish catch and reduce bycatch of other species.